Arriving in Barcelona the same week as the Catalan independence referendum and the violence that came with it made me somewhat nervous, but I knew I would be witnessing history in Barcelona as well. Not that I usually let things like that affect my plans. I moved to New York City nine months after 9/11, I moved to New Orleans after Hurricane Katrina and I went to the Caribbean for three months during hurricane season the year after Hurricane Ike. This was a bit different as it was so soon, but I decided I couldn’t miss Barcelona and it really was too close to my travel time to change my plans. 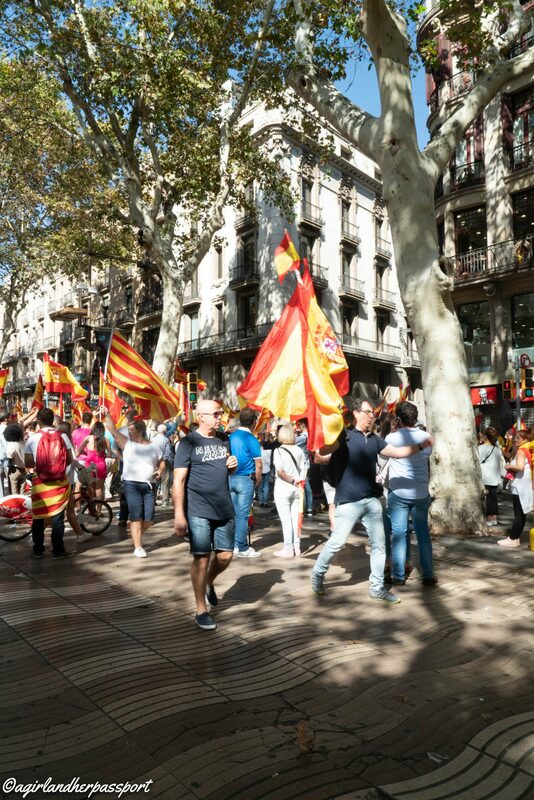 My flight landed in the early morning hours on October 7, 2017, so I didn’t see all the Catalan flags that were hanging from many balconies. I also had no idea that protests had been planned for that day and for the next day after. As I walked from my hotel to the Picasso Museum, I had to pass by the Palau de la Generalitat de Catalunya, the presidential offices of Catalonia. Not that I knew what it was at the time. 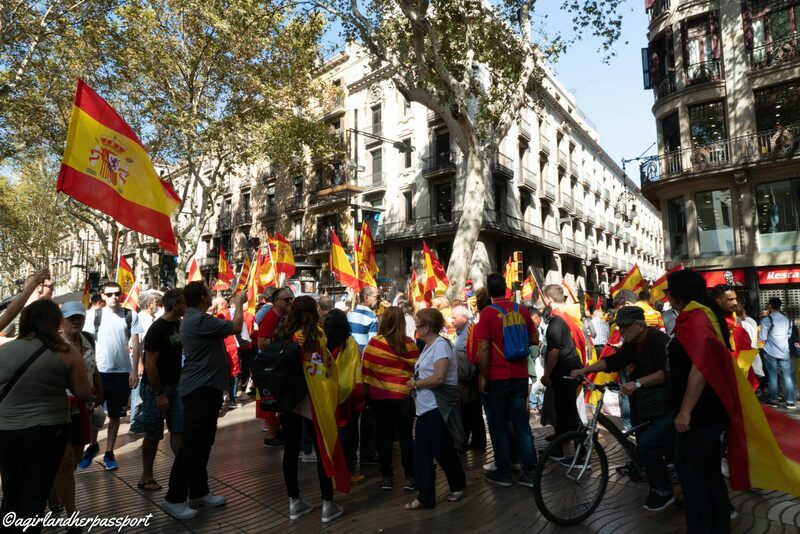 Crowds of people were dressed in white holding signs that read “Shall we talk?” in Spanish and Catalan, calling for discussions between Catalonia and Madrid. My nerves took hold and I wondered if I should find another way, but I soon realized what the signs read and many people had their small children with them. News cameras were also present and I felt a bit more comfortable but did not hang around. Helicopters woke me the next morning. That day I had tickets for the Casa Museu Gaudi at Park Guell. Given I already purchased tickets, I was not going let the protest get in the way. Along the way, the taxi had to stop many times for the protestors to cross. 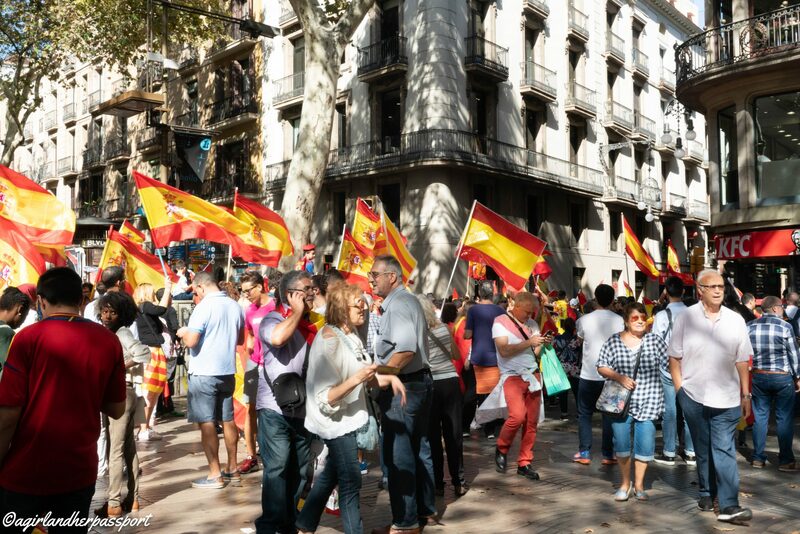 These were pro-union protestors and were carrying the Spanish flag. While this protest still seemed peaceful, there were many more people than the day before and they were chanting loudly. The taxi driver thought it wouldn’t last all day so I decided to spend more time near Park Guell than originally planned as it wasn’t near the protest site at all. Of course, vertigo hit that day and I eventually ended up back in bed at the hotel that afternoon unable to sleep due to the helicopters I could still hear overhead. Feeling better but still hearing the helicopters and chanting, I decided to go out anyway and went to Las Ramblas outside my hotel. It still didn’t feel dangerous, but I kept up my caution and only stayed on Las Ramblas for a few minutes. Fortunately, these all the protests stayed peaceful even though more unrest continued through the week I was there. Many people were concerned about me going to Barcelona and for a few days, I was as well. I watched the news and decided to go ahead. However, I know that this political unrest did change people’s travel plans. This included a trip my parents recently returned from where the itinerary changed from Barcelona to Valencia instead. Of course, I had told them it was fine but they were on a tour so they had to go with the tour. Making the decision to keep or change your plans has to be made on your own personal level of safety, news, and cost. If you feel comfortable and the news is peaceful then I would say continue on with your trip. But do need to remain aware of what is happening in the area. Which while there can be hard if you don’t speak the language. Avoid the areas of protest if you can. I was really unable due to lack of knowledge and my hotel location on Las Ramblas. Do not get involved as you do not know the whole situation. If you do decide to change your plans, check with you travel insurance and see if changing your trip might be covered. See if modifying your plans would cost that much. I could have flown into Barcelona and flown out right away, but this would have cost me my entire whole hotel stay as I had pre-paid for a discount. However, if things had been violent and I had been stuck in my hotel then I might not have cared. Ultimately, you have to decide what you are comfortable with. I kept my family and friends up to date with daily calls so they knew I was safe. I also had decided that if it did get violent, I would stay in my hotel until it was time to go. 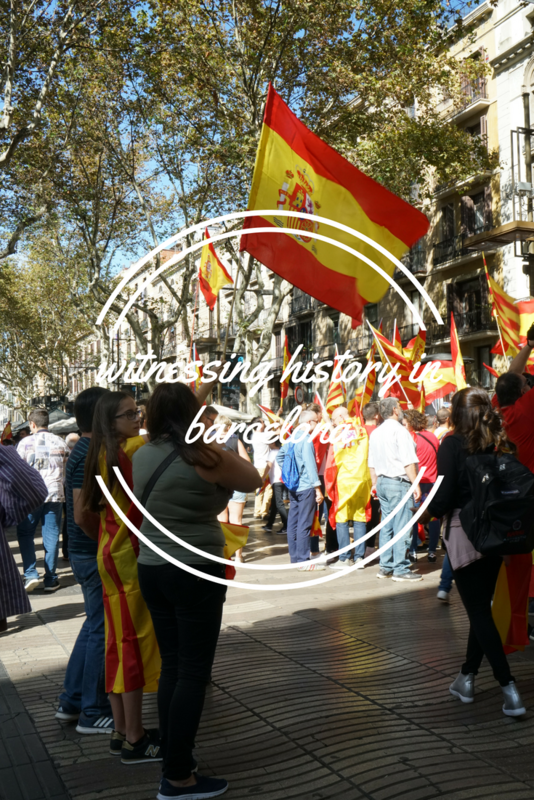 It was exciting to know that I was potentially witnessing history in Barcelona. Have you ever traveled somewhere during unrest? What was your experience? Hey Tiffany, thank you so much for sharing your experience and photos- this is such an important topic. Sending you good vibes for a wonderful weekend. I am so glad you enjoyed it! Thanks for stopping by. You too! I flew out of JFK seven days free 911. Witnessing and living history is surreal. Loved this post. Oh wow! That would be interesting. Thanks!